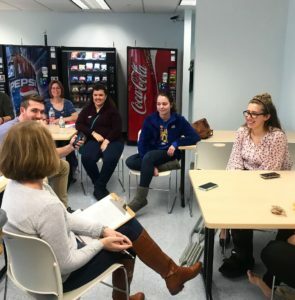 (Morton, PA) October 27, 2018 – Last week the Epilepsy Foundation Eastern PA hosted two of its annual Epilepsy Education Exchanges. 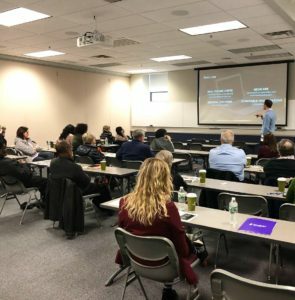 Community members in Northeast PA and from across the Greater Philadelphia region met to learn more about the latest in epilepsy research, treatment and management. Keynote speaker Dr. Mercedes Jacobson opened the Philly-area conference with a discussion on Living Your Best Life with Epilepsy. Highlights from her presentation included exploring how to work with your doctor to maximize your visits, identifying champions in your care team, the ins-and-outs of losing your driver’s license and healthy habits that will improve your quality of life. You can check out her full presentation slides here. Following the keynote presentation, guests mingled with our event sponsors at vendor exhibits. The group then broke into four workshops that covered Research & Clinical Trials, Navigating Insurance, Preparing & Navigating Transition and Self -Care Management. For over 20 years, the EFEPA has been putting on the Epilepsy Education Exchanges. The free conferences have become an integral part of our programs. Earlier in the week, the Northeast PA Exchange welcomed Dr. David Ortiz, one of Geisinger’s new epileptologists. Dr. Ortiz spoke about new treatments and technologies in epilepsy, stressing the importance of video monitoring in planning a treatment for seizures. This year’s Exchange also represented a special anniversary for the EFEPA as our Education Coordinator Sue Livingston celebrated 22 years on the team! Through her hard work and dedication, the conferences have become so much more than just an educational exchange but a place for those living with epilepsy to connect with a support network. Want to hear mores stories from our epilepsy community? Keep a look-out for video interviews with our Epilepsy Champions for National Epilepsy Awareness Month! Weren’t able to make it to the Epilepsy Education Exchange this year? In December, the Educational Conference page will have video of the full keynote speech.